We had a new roof put on the house and garage recently. Not terribly exciting for anyone but us, but I did enjoy taking almost one hundred pictures of the process. No, I won't ask you to look at them all. But I did want to post a couple pictures going back to when we bought the house. 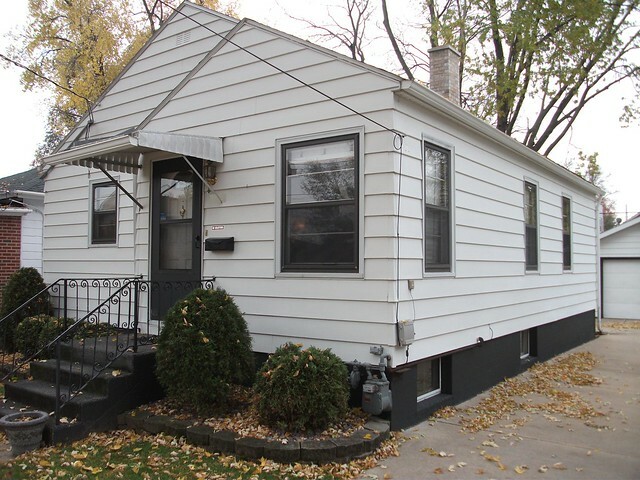 First picture is the house as it was when we bought it. Our little, bland, white house. This next picture is after we had the windows installed in November, 2013. The new windows, aside from being so much more efficient than the original windows, look so much better. Inside, the fake wood grain finish blends right in with the original trim, and outside we had black flashing installed around the windows to make them pop a little. We think it worked out rather well. Finally, the third picture is our house now, after the new roof and gutters but before the power company removed the electrical wire protection, top left, that they put on when the permit was pulled. No, you can't really see the roof, but it looks like any other new roof. We got ours in black onyx in keeping with the black and white theme. We also repainted the foundation and front railings since the second picture, 'black as Swedish death metal,' as the paint mixer at the store put it. We also changed out the front door light and added new, black, more visible house numbers. 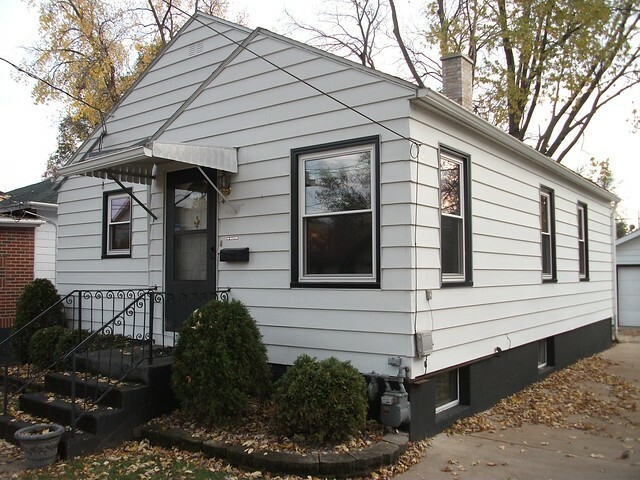 And, among other things, we still want a new screen door for the front, and perhaps a new mailbox - black, of course. The only real difference that you can see in this last picture is in the drip edge along the roof line. 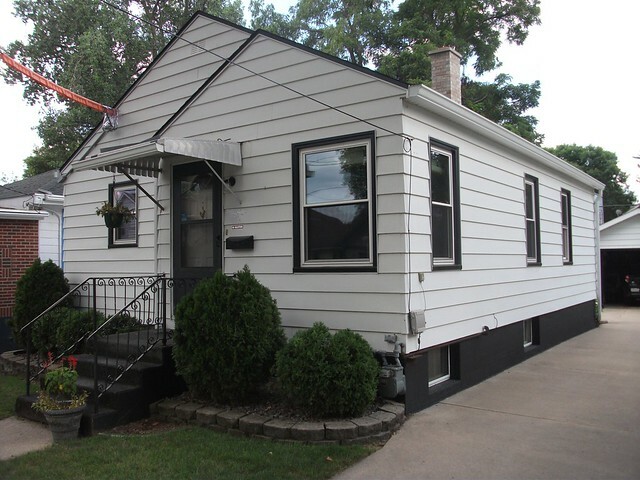 We have no overhang so I came up with the idea of making the drip edge black on the front and back gable ends of the house to give the roof more definition, and we are very pleased with the result. Even the roofing crew that installed it was impressed that I came up with it. One even told me he wishes more homeowners did something like this. The black edge does exactly as I intended, and with the twin peaks out front it looks very good, indeed. I had a pretty nice weekend, I hope you did, too. 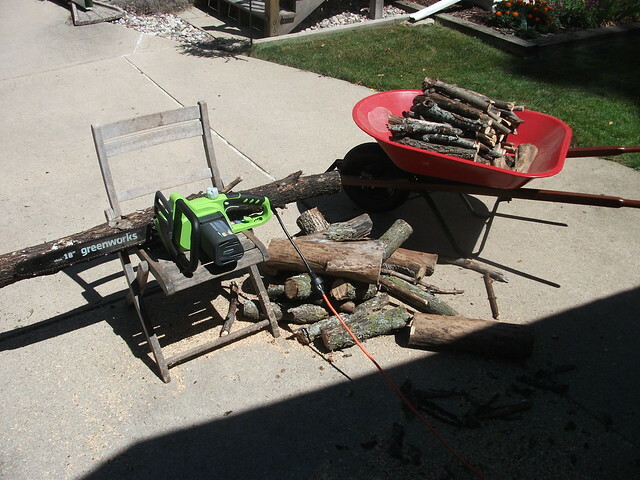 On Saturday I got several outside chores done, including getting firewood cut with my new chainsaw! It's bigger than I actually need, but it was a really good deal. I had been saving scavenged wood for fire pits but that would be a lot of cutting with the hand saw, now I can scavenge away and not worry about the work of cutting it up. A few more fire pits and the saw will have paid for itself rather than buying expensive bundles of firewood from the store. There's a lot of trees in Madison, and a lot of falling branches that are free for the taking. Later that day we also went over to my sister in law's house to see our newest and tiniest nephew. Well, I'm not posting pictures of that, so that's that, then. We were invited by Kate's friend Terry to go out on the boat Sunday. I was not sure that I wanted to go, but I'm glad I did. Thanks, Terry! I was able to kick back and have a few drinks and not drive anything anywhere. Again, it was a beautiful day for it, not too hot and not too sunny. Still, don't let the clouds you see below fool you - I came home with minor sunburns on my arms and knees. My own fault as I skipped the sunblock because I wanted more color. 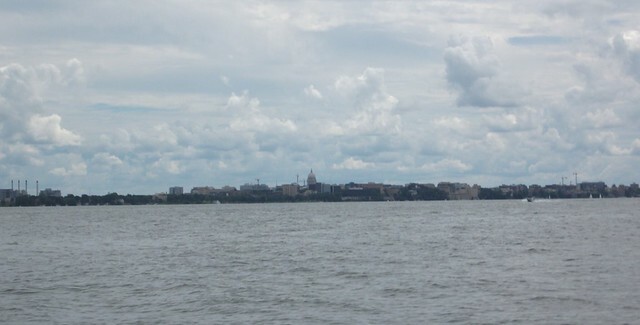 A zoomed in look across the lake at the Wisconsin State Capitol building in the distance. 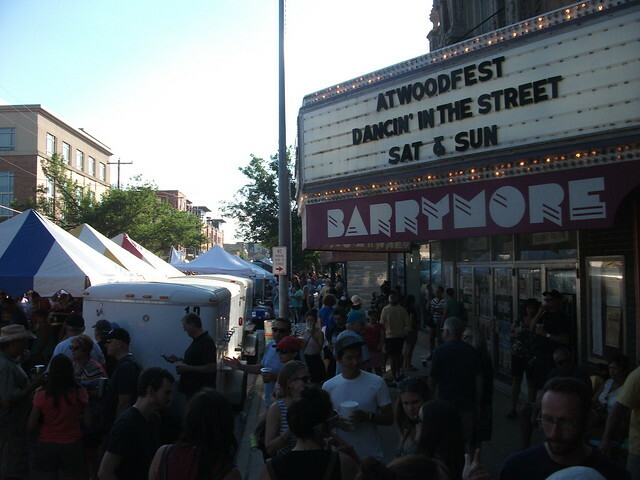 Atwoodfest, a neighborhood festival on this near east side of Madison, happened this past weekend. Bands, beers, vendors, beers and friends, all day each day. Well that would be a bit much, but we did manage to spend a few hours down there both Saturday and Sunday. The weather was beautiful, temperatures in the low 80's and the sun made it quite warm, however not as hot as last year. 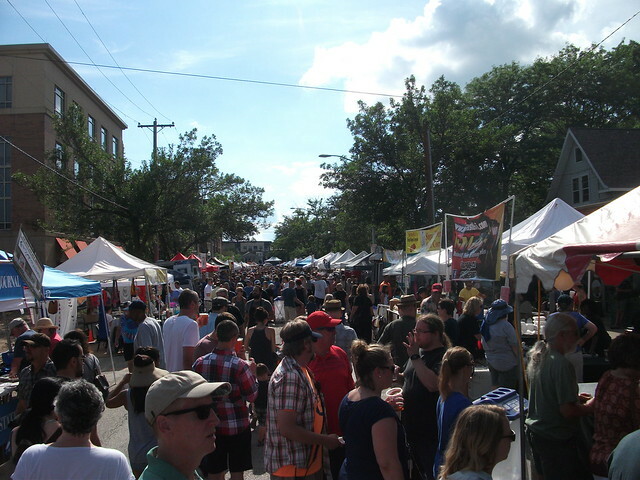 After Mike's visit on Saturday (see last post), we walked down to the festival. It's just a great atmosphere - and it seems to be getting bigger every year. We tried some food, though not as much as years past, and bought frivolous festival wares. We saw some friends and coworkers on our walks up and down the street. This Atwood Avenue area is only about a 15-20 minute walk from our house, depending on your gait, but then you are on your feet the whole time unless you are lucky enough to come across a rare chair, ledge or curb.. My legs and feet held up well this year, but it did take a toll on my back. Thus I have the extra time to write this now. Some more pictures after the break!